I needn't have said much more as my teacher was Ernest Neal one of the leading naturalists of the day and also a wildlife photographer. The Baldix was a good step up as for a couple of years had been I using two hand-me-down simple cameras which I still rate as invaluable experience. 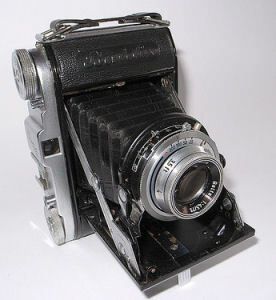 In the early 1950s such cameras as the Baldix and others made in West Germany were in short supply due to import controls placed by the UK government to stem the outflow of Pounds Sterling. The country was recovering from World War ll. Ernest Neal who by then was famous for his photos and work with badgers used an expensive British made Agiflex not subject to Sterling controls as even its lens was made in England. My Baldix used '120 size ' film in rolls to take 12 pictures each 2 ¼ inches square [6x 6 cms] and like the cameras was still in very restricted supply. Black and white film was easier to get than colour film even if you could afford the price. A roll of film for 12 pictures was the equivalent of about £15.00, today  Processing costs were extra. And remember the average wage was about £5.00 per week. In those early days much of my photography was a hobby but one where my friends and family paid for prints on photographic paper. School or village parties and new clothes were especially good for the cash flow and soon I discovered that black and white prints were a quick sell while colour was out of reach by price. But anyway, I had to try colour. That was a 'must do experiment'. In my home town of Taunton in Somerset we had several 'photographic chemists' where by tradition they sold cameras, film and the chemicals for processing. I had shot about five rolls of black and white on my new Baldix and 'Maunders' in the main Street received a few rolls of Dufaycolor film at price much lower than their other colour films such as Ferraniacolor - from Italy or Gevacolor -from Belgium. There was no British equivalent in the 120 size apart from Dufaycolor made by Dufay a company based in Hertfordshire 16 kms northeast from central London. Also, and I did not realise it at the time the Dufaycolor in Maunders was the end of the line. 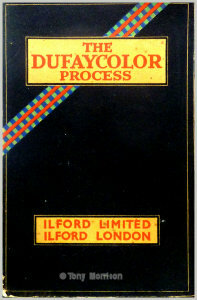 Dufaycolor production was suspended in 1956/57. Maunders also stocked the chemicals I needed for home-processing the film. I cannot recall if I bought a Dufay Developing 'kit' made by Johnsons of Hendon or the individual chemicals. I feel it could have been just the chemicals as by then I was studying chemistry as a school course. Firstly, here is the outline story and then follows the science bit which will be as a non - geek précis. I promise. The web has plenty of deeper info. Dufay was preceded comercially and successfully in 1903 when two French brothers August Marie Louis and Louis Jean Lumière produced their colour system later known Autochrome Lumière. The main difference between the two systems was the method of breaking down the scenes into the dot sized monochrome replicas of the colours. 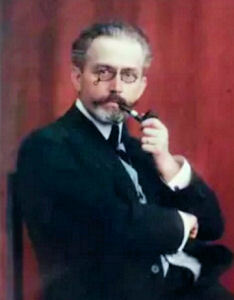 Autochrome was taken up enthusiastically by the photographic community. Autochrome for amateurs and professionals lasted as a colour film until the 1930s when Kodak in the USA and Agfa in Germany launched their own colour products based on a totally different system. Up to that time the National Geographic Society with its now famous 'Big Yellow Magazine' provided its photographers with Autochrome and there are about 17,000 of their colour pictures in an extraordinary archive. The booklet on the right dates from the Ilford era and contains a brief history of the product and its revival with better technology. My interest in Dufaycolor began when as a student I saw some end-of the line stock in 'Maunders' a local chemist shop at a price I could just about afford. So now, how did the film reproduce colour? 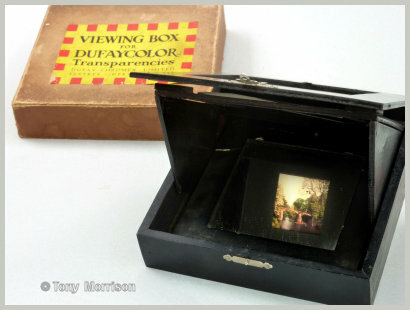 Dufaycolour and its predecessor Autochrome were black and white films very craftily adapted to replicate colours. Film as we knew it and as still exists, consists of a transparent base such as strong semi-rigid plastic with a light sensitive emulsion coating one side. The early coatings were made of egg albumen or gelatine sensitised with silver compounds. Collodion a product of nitro cellulose aka guncotton an explosive dissolved in ether was also used -'sounds a dodgy snap shooter to me. In a camera such as my Baldix light falls on the film's emulsion and causes changes to the silver that can be enhanced by using solutions of chemicals generally known as 'developers'. The changes can be retained permanently by using other chemicals - the 'fixers'. The result is a negative image --- dark where light has fallen and paler for areas recording, say a shadow or black hat. To make the prints for a family album, sensitive paper was exposed to light passing through a film negative. Light or pale areas in the negative formed darker areas on the print. OK So far? Dufayclor and Autocrome coated one side of their film base with a pattern of colours. Autochrome used a random scattering of coloured grains of potato starch and Dufay a printed pattern of coloured lines or réseau - this is the stuff of the early inventors. 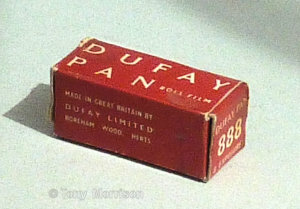 By the time Dufaycolor was being made commercially the lines of the réseau were being printed on the film base 20 to each millimetre. A thin varnish over the réseau assured its permanency. The images are from the Ilford -Dufaycolor booklet. On the right are the stages to build up the final pattern - bottom right. 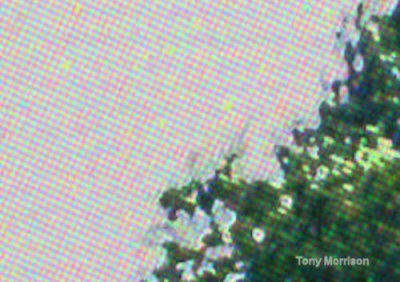 And below a section through the final film. The colours to reaching the sensitive layer were recorded with a density of light and shade proportionally. A 'latent' image was created in the sensitised emulsion ready to be processed. The films could be developed normally in chemical solutions to obtain a black and white negative image and by simple wizardry with more chemicals they were changed to a positive image. Don't glaze over as the next part is the fun bit. Hey Presto ! A colour picture. The images were not brilliantly coloured as we are accustomed to seeing today. A picture by this method was in effect a black and white image with its light, shade and gradations of colour being viewed through the film base and a screen of coloured starch grains or Dufay's réseau. But it worked - and that was invented over 100 years ago. 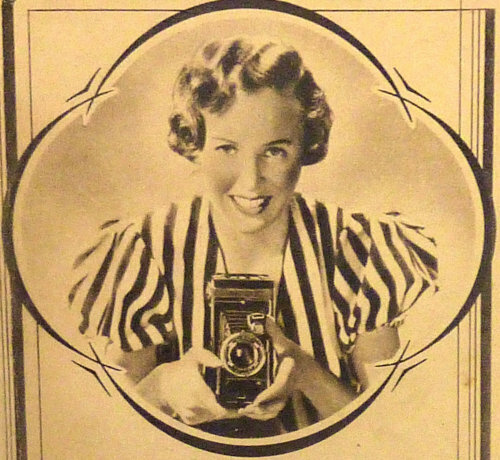 In the 1930s Ilford and Dufay marketed a special viewer to show the images in sunlight and with a filter for indoor light - in those years usually a reddish incandescent electric lamp. David, a school friend lived a few houses down the road and was similarly fascinated by photography. My excursion into colour in an age of black and white plus the challenge of home processing drew David to the rear door of my parent's home at 5 AM one early summer morning. The days were warm and with ice from a fridge our only way to work at a controlled temperature of 65° F [ 18.3 °C was in the stone floored kitchen using water we had left in buckets outside to cool overnight. The chemicals in solutions had been made the night before and also were kept outside. The Dufaycolor film I had shot on the Baldix was pre-loaded in a lightproof processing tank. Apart from an array of chemicals - none of which was seriously dangerous - maybe the sulphuric acid was the worst, the developing process was fairly straightforward with about 10 steps. We anticipated only one critical moment when we were to expose the entire film to a 100 watt light for four minutes at a distance of about three feet or just under one metre. After that exposure it was possible to complete the processing in subdued light. and schoolboy expletives. 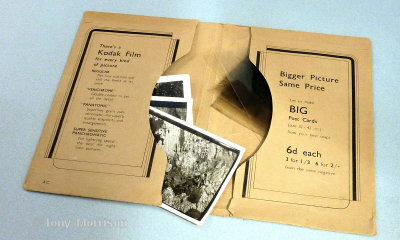 Our efforts and the developed images went into a bucket as slop. But all was not lost as a small section of the film remained intact and we salvaged four shots. 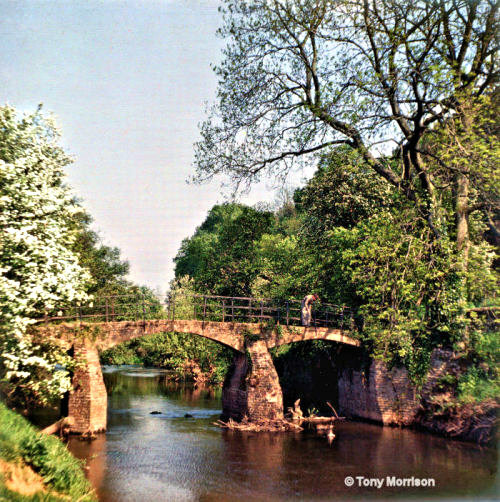 One - the Netherclay Bridge is a favourite even after my sixty years of photography worldwide. The bridge is still standing and the foliage is a grand as ever. 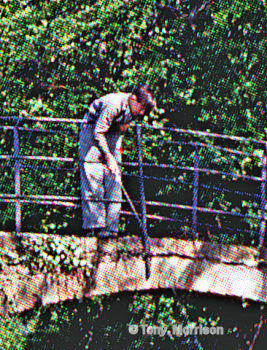 That's David on the bridge with a fishing rod - his hair is a youthful reddish and now grey he's still taking pictures with his collection of Leica cameras . Back in 1954 David had a Dacora which, like my Baldix was made in West Germany - memory lane stuff indeed. And the other survivors on the roll of film. Right - Geraniums and an old brick wall in Taunton. 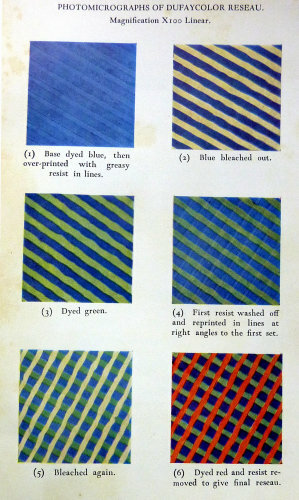 One of the recommendations of Dufaycolor was to choose colourful, bold subjects. Here the sun and contrast was just too severe. A line in the 'troubleshooting' page of a Dufay technical booklet suggests it may have been too strong [concentated] bleach 'bath' or too long in the solution or a difference in temperatures between each bath But from the Dufay experience I moved on to the newer systems of Ferraniacolor, Gevacolour, Anscochrome for transparencies [slides] and Kodacolour and Agfacolor for prints. It was not until the Bristol University Trans-Continental Expedition [see on this site] that I used Kodachrome almost exclusively with a few rolls of Kodak Ektachrome. Kodachrome was an invention of the mid 1930s and lasted until 2005 - it proved to have colours that lasted longest without fading.